If you like apple wine, you will feel at home in Frankfurt. Here are plenty of apple wine taverns where you can enjoy different apple wines from the region. Apple wine is an essential part of Frankfurt culture. 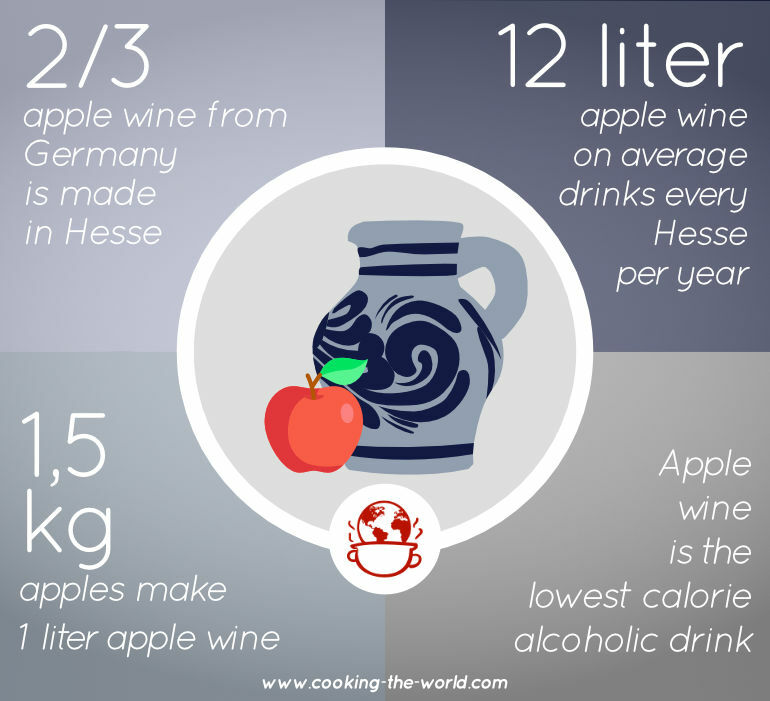 3/4 of all German apple wine come from Hesse. Every Hesse drinks on average 12 times more apple wine than people from other federal states in Germany. Frankfurter love their apples and apple products, from apple juice, apfelschorle, to applesauce and apple cakes. It is hard to imagine a life without apples here! 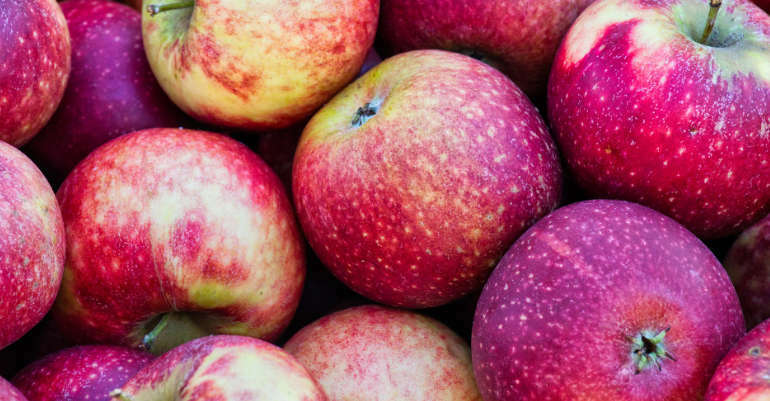 It was a windy Sunday morning in October, but the sun was burning so my husband, and I got into the car and drove to Frankfurt Erlenbach to gain knowledge of the most beloved German fruit: the apple! The tour took place at a fruit farm called Obsthof am Steinberg, 20 minutes car drive from the city centre. At this farm, they make many different organic products from apples, mainly apple wine and apple cider. Our guide and the owner of the company, Mr Schneider, told us some interesting stories about apples, its production and besides inspired us to plunge deeper into this topic. We discovered that the good apple wine doesn’t have to make of different apple sorts! One variety of apples make also very tasty apple wine! We also had a chance to try young apple wine, apple cider and standard apple wine. The quality of the products convinced us, and we decided to buy some young apple wine and apple crisps! (those were the best once I have ever had). Why apple wine? Why in Sachsenhausen? Romans brought the apples to Frankfurt. That time in Germania there were only wild apples. Wild apples were smaller, much sourer and harder in the consistency; therefore, the sweet apples from the south of Europe convinced the Germans! As a result, they decided to cultivate them! In the 17th century, the climate has changed in Frankfurt and it was too cold to grow the grapes. Therefore the farmers who lived in Sachsenhausen decided to plant apple trees and make wine from apples! How to drink apple wine? There is only one right way to drink apple wine in Frankfurt: pure. In summer it is ok to mix it with either 50% or 20% sparkling mineral water. In other regions, Germans tend to mix their apple wine with lemonade, but if you want to maintain any level of respect from the tavern owner, you will order your wine pure. Imagine doing a wine tasting in a vineyard in the south of France or Italy and asking for a sprite and pouring it into the wine there. It would be so bad! 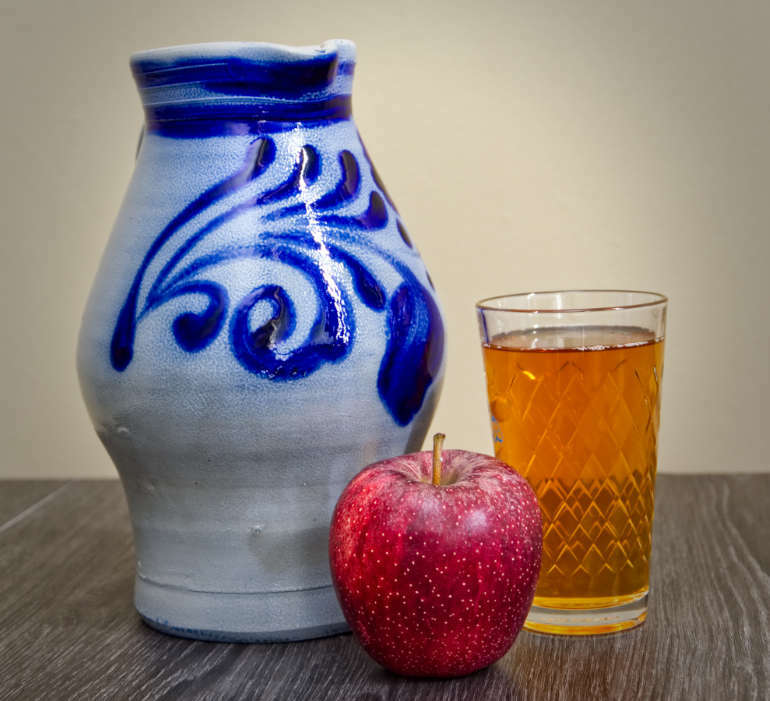 The Frankfurt apple wine is usually served in a Bembel (a stoneware jar) and this way it remains cold and pleasant to drink. It is poured into apple wine glass, called Gerippte, which describes the glass pattern. Because of this particular pattern the glass doesn’t slide so easily, even when grabbed with fatty hands in the times where the cutlery wasn’t normality. The only right size for the apple wine glasses is 300ml. If the tavern uses a 250-millilitre glass that could mean that the apple wine is bought somewhere else. Usually, there are different apples mixed to create good apple wine. Although Mr Schneider (from the fruit farm) produces apple wine and cider made from only one sort of apples, e.g.. apple called Kaiser Wilhelm. I can assure you that the apple cider made of this sort of apple would be one of the best ones you will ever have! To make house wine, they take unripe and sour apples, which still creates a delicious product! How to enjoy apple wine? In September and October, you can enjoy not only the standard apple wine but also young apple wine, called „Süßer“. As the name indicates, the young apple wine is much sweeter than the regular one. Where to enjoy apple wine? Above all, you can enjoy apple wine in apple wine taverns. Most of them produce the wine on their own. To realize that, you just need to look for a wreath at the tavern door or gate. A wreath is always a sign if the apple wine tavern still makes is own wine. Before you go to an apple wine tavern, you need to be aware of the fact that they have a unique atmosphere. There is no music, you will be seated on long tables and hard benches. And you should be thankful when there is a pillow for your bottom! It is not going to be cosy nor romantic, but authentic. Additionally, you shouldn’t expect the waiter to come when you will be ready to order, he will come whenever he is ready. Make sure that you decide what to order right after you get the menu. If you are a huge fan of apple wine and you would like to try different apple wine variations I would highly recommend visiting the fruit farm. They have endless orchards where you can go for a walk and a restaurant where you can enjoy organic drinks and food. Other than this you can also buy a different kind of apples and apple wine products. If you are interested in visiting apple wine tavern in Frankfurt, have a look at the video where we share the 8 tips for visiting apple wine taverns in Frankfurt. And if you enjoy Frankfurts cuisine, please check our Hand Cheese with Music and Frankfurt Green Sauce recipe.